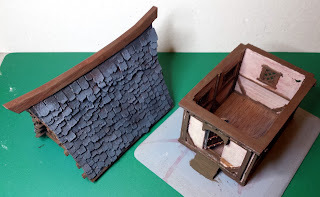 I have been very busy recently and haven't had much time to build any new scratch-built Frostgrave terrain. 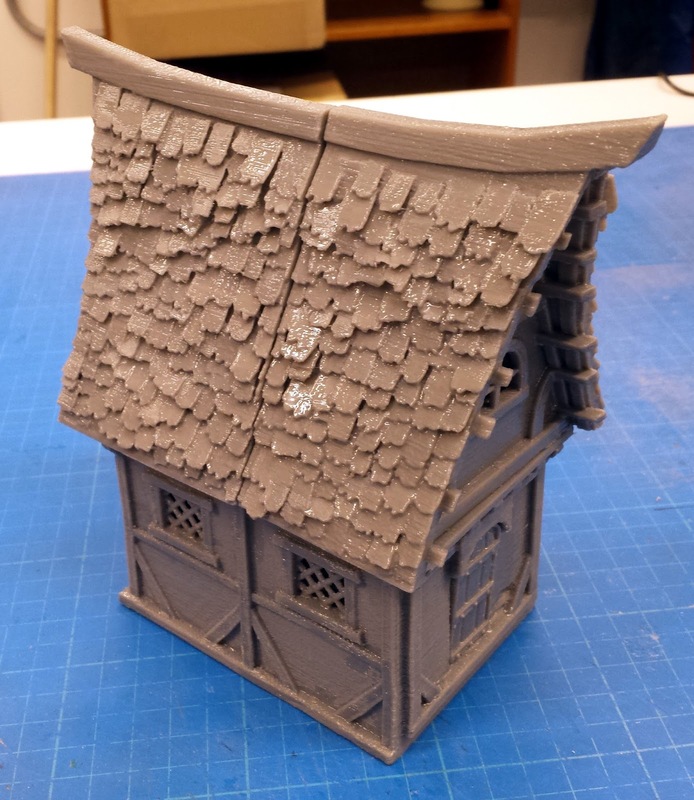 However, I did back printablescenery.com with their Winterdale Kickstarter campaign to produce a range of wargaming scenery that people can 3D print themselves. 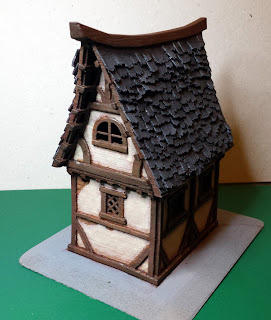 With the campaign I have got enough files to produce just about anything that a I would need for a fantasy wargames table, including a fully expandable castle, village buildings including a blacksmiths forge and an inn, and plenty of other scatter scenery, such as walls, a bridge, stockades and gnarly trees. 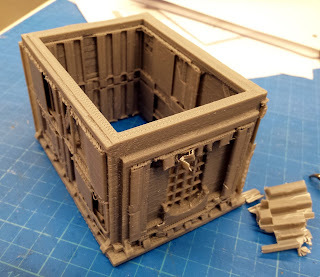 We have had two 3D printers in the workshop for 3 or 4 years now and they have run very well, although the driver software for them is not the most versatile. I am building a new 3D printer, but that will not be finished for a while yet, so I used the workshop machines to do some test builds on the printablescenery.com models. 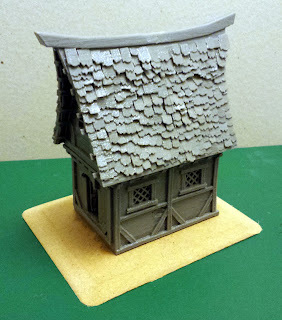 Next up I decided that I would again keep things fairly small and use the files for the Bridge Cottage. To keep things even simpler I didn't build the lower stone section and just used it as a simple one storey building. 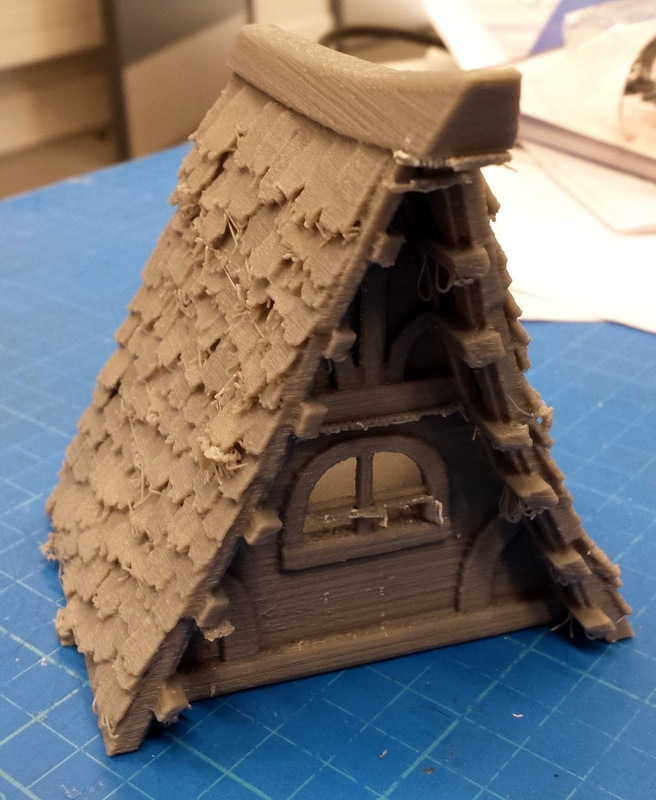 The first parts that I printed were the two halves of the roof. 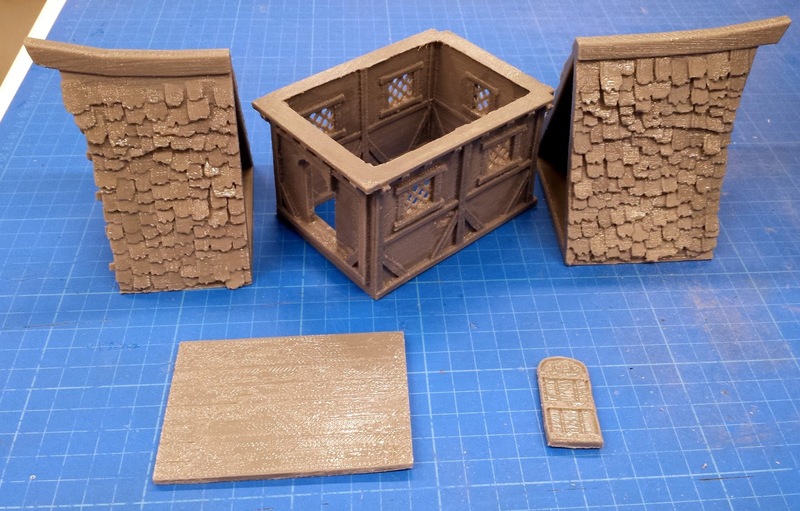 The files that printablescenery.com supply are laid out in the best orientation to allow 3D printing without printing supports. However, the Up Plus One cannot be set to print without supports, so we have printed them in a different orientation. 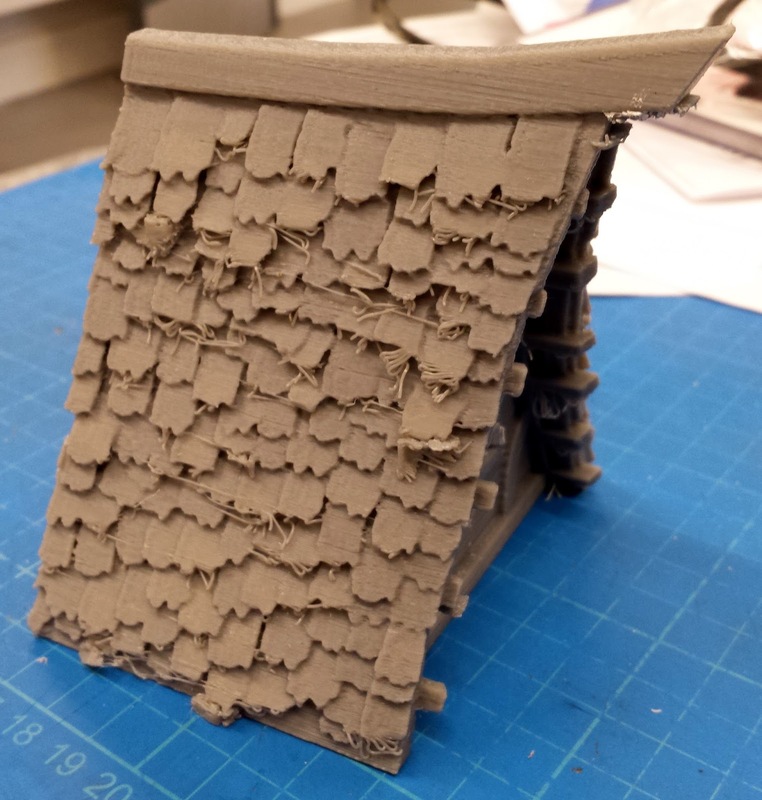 The roof sections were printed the way they are seen in the photos, as this gave the minimal level of necessary support. The roof sections went very well and gave a very substantial build. I must say, I think that the wall thickness on the roof sections is possibly a little excessive. They do want to be strong enough for repeated handling, but these pieces are literally strong enough to stand on! 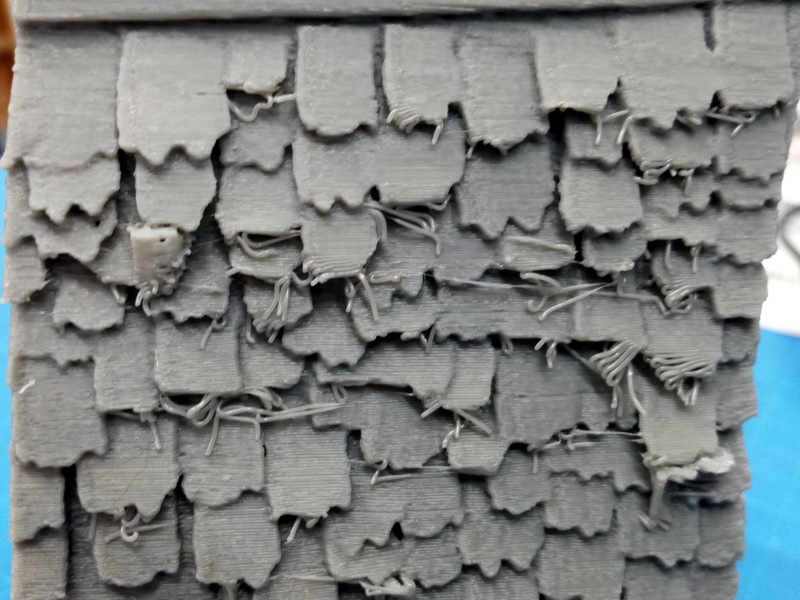 As you can see from these photos there are a few "stringy bits" on the roof tiles. 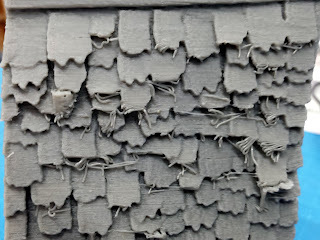 These were not too bad, and would not take long to clean up with a craft knife. 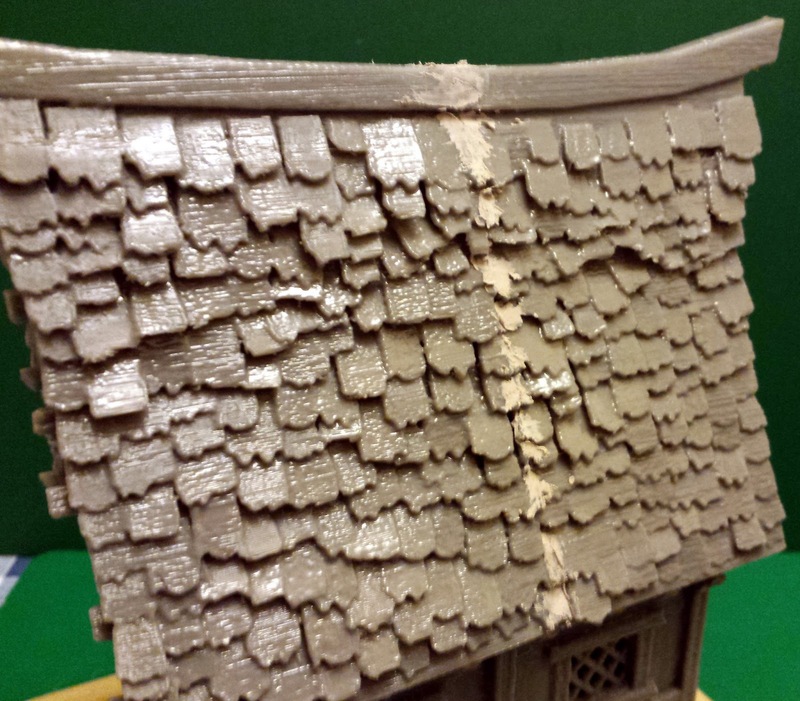 I spent 10 or 15 minutes cleaning up the two sides of the roof and the painted on a quick coat of solvent (dichloromethane, or liquid plastic cement), which finished off the roof nicely. 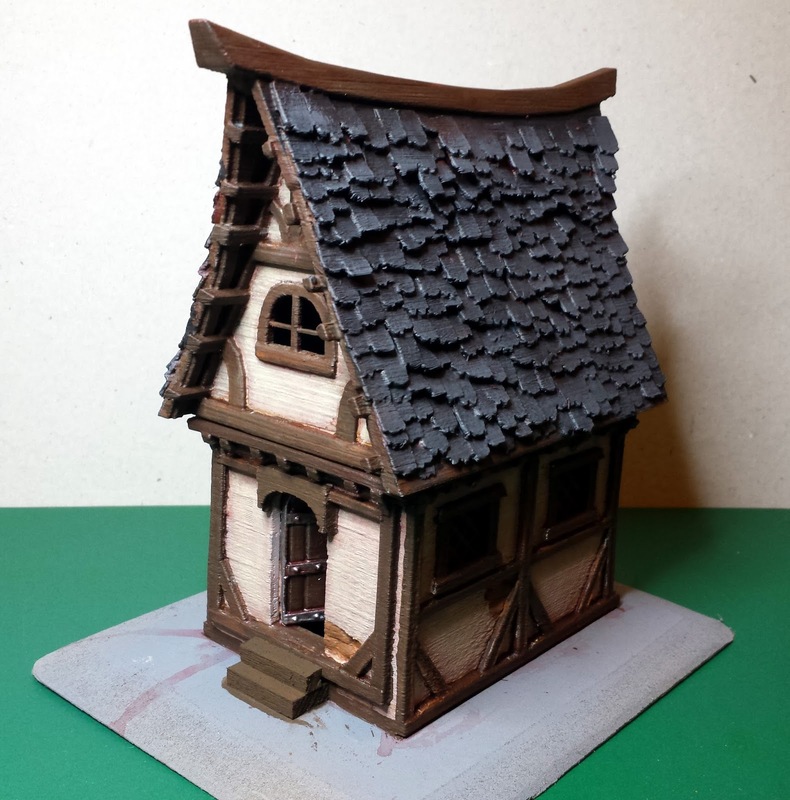 Next up was the ground floor walls. 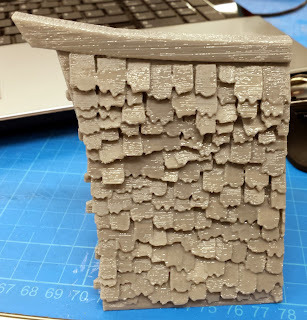 Once again, not being able to turn off the support meant that the model was left covered in a layer of support all around, both inside and out. \This did take me a while to clean up, but once removed the build was very nice. 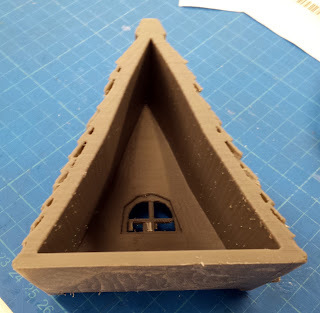 The part is designed with a grill in the place of the door, so that it does not need support material (...), I cut this out once printed. 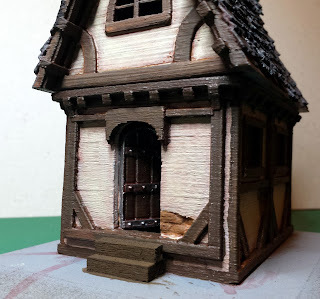 Finally I printed the floor and the front door. 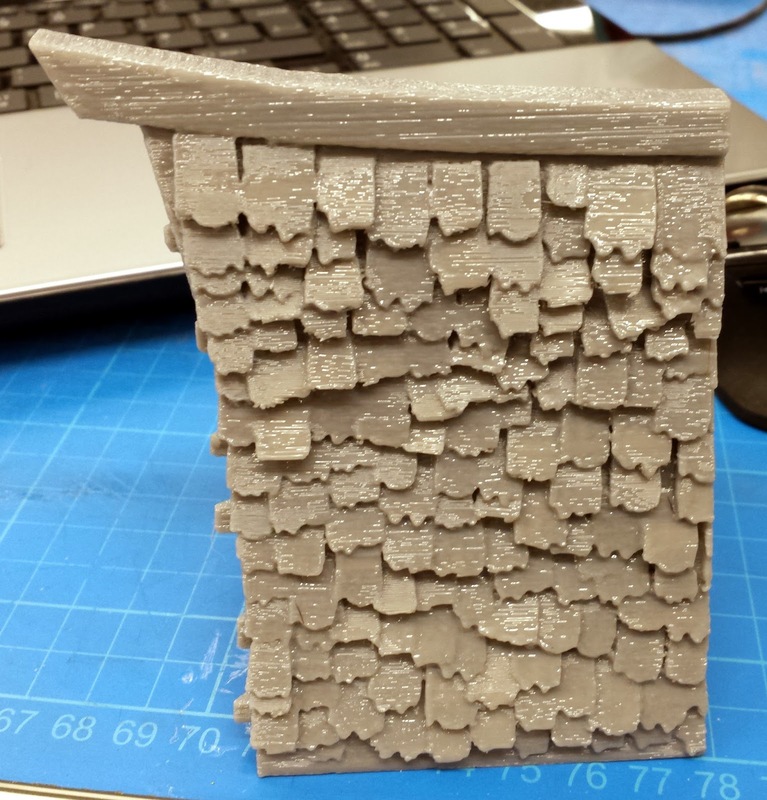 Once the parts had been cleaned up I put the thing together, just to see how it looked, I think you will agree, the it looks pretty good! 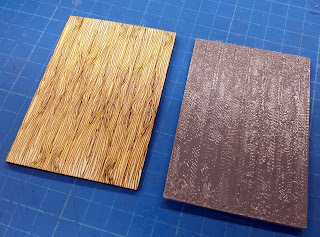 Although the 3D printed floor gave a reasonable wooden effect, I decided to laser cut a piece of thin plywood with a wood grain. 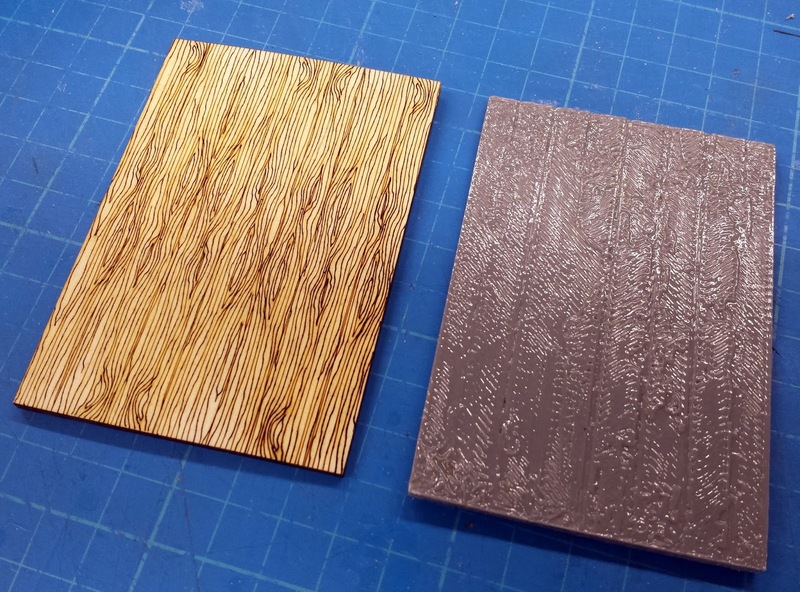 As you can see by these two pictures, it doesn't make a lot of difference, but I was happier with the laser cut floor. 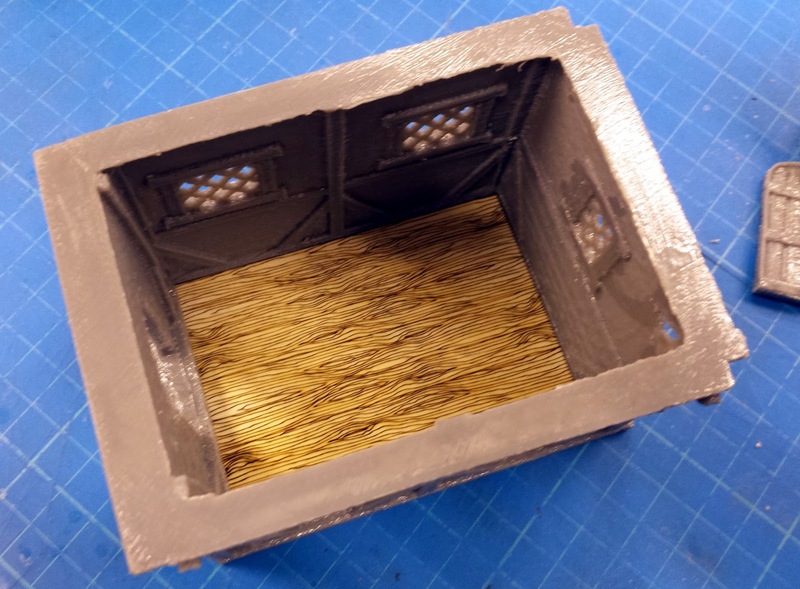 The floor that I 3D printed didn't go to waste. 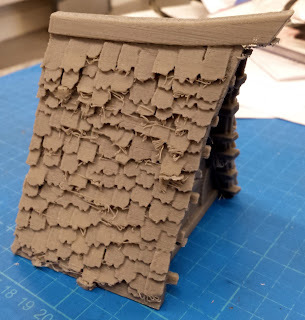 I glued it to the base of the roof section and it worked really well for locating the roof on to the top of the walls below. For future reference, I plan to magnetize the roof so that it sits nicely on top of the walls. The two parts of the roof fitted really well and only left a small seem. 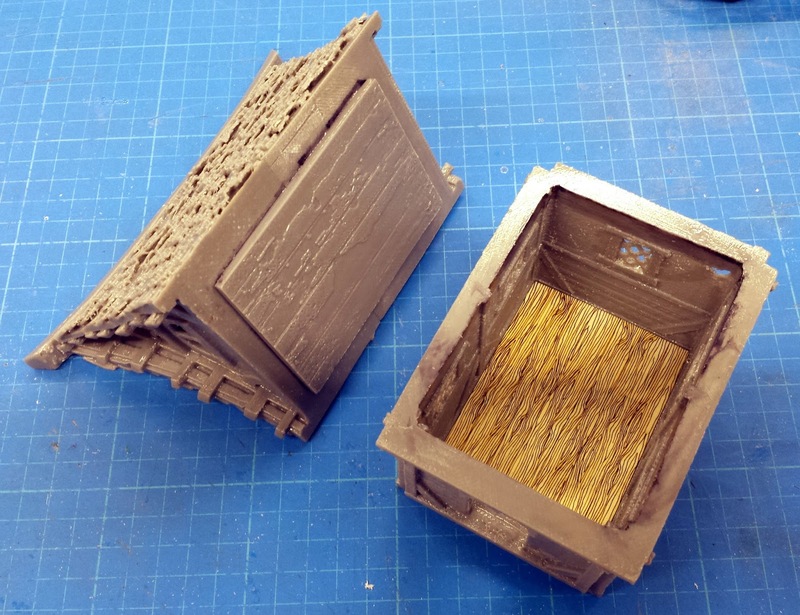 I filled this with knifing putty. 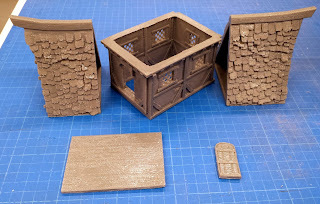 This is very similar to modelling putty, but is a lot cheaper. 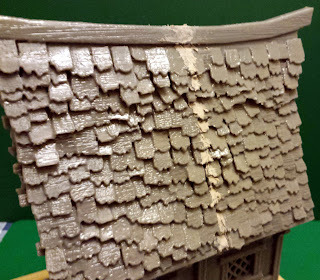 Once dry and sanded the seem was virtually invisible. 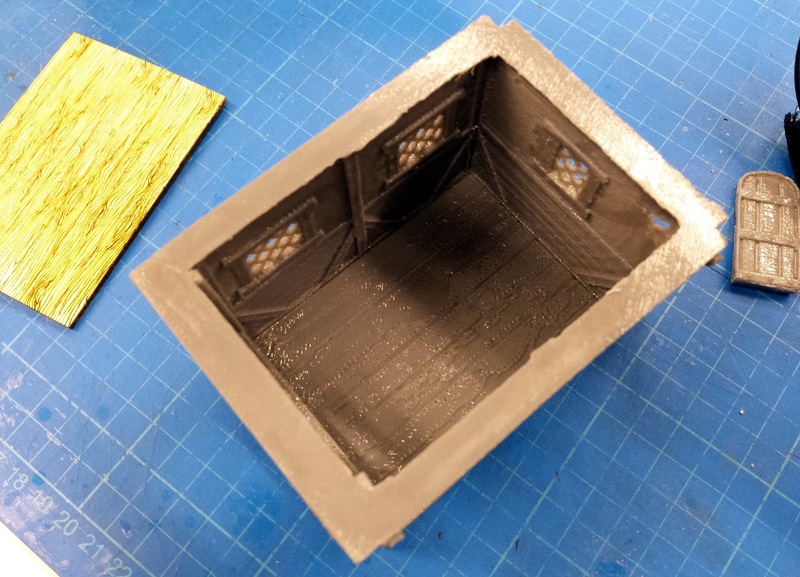 Now, as this was theoretically the first floor, and there should have been a stone section below it, I had to add a door step, which I did with a piece balsa wood. Finally i spent a bit of time over the weekend painting it. I am extremely pleased with the results and will be moving on to printing some more of the range over the next few months. I didn't spend too much time painting the internal detail, after all, it will rarely be seen. However it is nice to know that it is there, if I do need to use it! 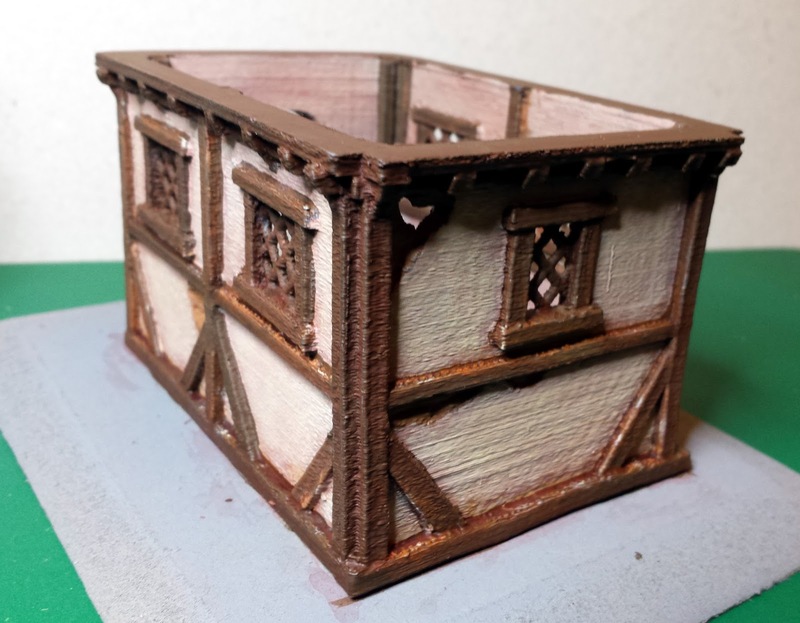 PrintableScenery.com are running a follow up Indiegogo campaign, to expand the range with some extra pieces, and also give people who missed the Kickstarter a chance to pick it up. Check out the new campaign HERE.